"Avoid buying super-expensive top-of-the-line interconnects without hearing DH Labs' Revelation first." Among the people I admire most in high-end audio is Darren Hovsepian, whose initials make up the name of his company, DH Labs. For over a decade, Hovsepian has been creating audio and video cables that don't push the limits of pricing but do offer performance that outdistances their cost. Darren's BL-1 interconnects and T-14 speaker cables are de facto budget-cable references, and his Air Matrix interconnects and Q-10 speaker cables bite at the heels of much pricier designs from other companies. Darren is an earnest fellow whose products are the result of much research and deliberation. He specs his wire and chooses his connectors carefully. If you ever want to know about BNC connectors, for instance, call Darren. He's measured most of those available and chosen the best for his D-75 digital cable, which at its $75 USD price is just about the greatest cable bargain there is. In 2001, Darren began working on a project that he admits "took a lot longer than I thought it would." It was not the creation of a new cable but rather of a new connector, the Ultimate RCA. The rationale behind the creation of this new RCA plug was simple: Essentially all other RCA connectors available were limiting the advantage of using high-purity conductors in interconnects because they were "full of other metals," as Darren points out, including zinc, lead, and tin. Most of all they use brass, not because it's good for conducting an audio signal but rather because it's easy to machine. The Ultimate RCA is more than 99% copper, specifically High Copper Alloy, which DH Labs worked with metallurgists at the Copper Development Association to develop. DH Labs claims 93% conductivity for the Ultimate RCA, and this outdistances competing RCA connectors by up 70%. Yes, DH Labs has done measurements. Last year, DH Labs started putting Ultimate RCA connectors on its Air Matrix interconnects. I reviewed the Air Matrix interconnects a while back and can attest to improvements in sound brought about by the use of the Ultimate RCA. But instead of writing about this difference, I talked with Darren about reporting on his Revelation interconnects, which also use the Ultimate RCA -- could a cable called Revelation use anything other than an Ultimate connector? 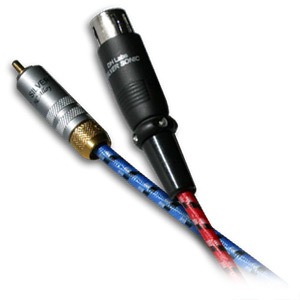 While the Revelation is decidedly upscale from the BL-1 in terms of price and is DH Labs' best offering, at $350 per meter pair it costs far less than other top-of-the-line cables. The Revelation's cost is due to its use of six 23-gauge pure-silver conductors that are each insulated, according to Darren, "in an air-spaced, tape-wrapped version" of his Air Matrix dielectric. In the case of the Revelation, this dielectric is an "air-articulated" PTFE Teflon tape that is applied at low tension and at room temperature. This means that there are no extruded insulation materials in the Revelation, so the pure-silver conductors are not exposed to any heat after being annealed. Heat changes the conductors' properties and affects the ultimate performance of the cable. So with the Revelation you not only get pure-silver conductors that are handled with extreme care, you also have an RCA connector that was designed from the ground up to enhance conductivity. The result is an interconnect that sounds as clear and uncolored as any top-level interconnect I've heard but doesn't cost anywhere near what those other cables do. In a nutshell, the Revelation has much of the openness and subjective speed of Nordost Valkyrja, the midrange palpability of Analysis Plus Solo Crystal Oval, and the overall balance of Acoustic Zen Silver Reference. The Nordost and Acoustic Zen interconnects cost far more than the Revelation, while the Analysis Plus comes in at $50 more per meter pair. That the Revelation hangs with this distinguished crowd is an achievement; that it does so at lower cost is, well, a revelation. What's even better is that the Revelation was a good choice with a very wide array of equipment. I used balanced and single-ended runs with tube and solid-state electronics from Lamm, Song Audio, Mark Levinson, Odyssey, Atma-Sphere, and Belles. In no case would I have chosen some other cable to effect an obvious sonic signature, and in each case I had the distinct sense that I was hearing all that the electronics had to offer. After getting a sense of the Revelation interconnects, I was curious to hear an entire DH Labs system, so I inserted two runs of Q-10 speaker cables to biwire ProAc Response D38 speakers, and the results were glorious. If the Revelation interconnects interest you and you're looking to save even more money with your choice of speaker cables, Q-10 sells for $225 per eight-foot pair and sounded terrific lashed to the ProAc speakers. All of the consideration that Darren Hovsepian puts into his cables would be for naught if the cables didn't live up to their pedigree with commensurate performance. They do. I've now heard every DH Labs interconnect and speaker cable, and each is a benchmark at its price and competes with products costing several times more. One of the best pieces of audio advice I can give is to avoid buying super-expensive top-of-the-line interconnects without hearing DH Labs' Revelation first. Now, Darren, how about creating some Revelation speaker cables? Price: $350 per meter pair.